Is Coconut Water the best fluid to hydrate you? Coconut water has become a popular beverage especially among athletes since it contains a lot of potassium almost as much as a banana. Bananas however spike your blood sugar. 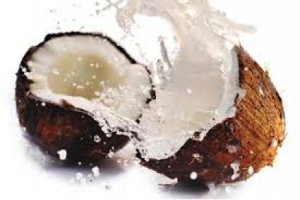 Coconut water does not have cholesterol or fat and has small amounts of protein and minerals. Don’t confuse this with coconut milk, which is high in fat. Coconut water does not replenish sodium as well. Popular sports drinks contain about 110mg of sodium and coconut water has about 40-60mg. It does not have enough protein to be considered a recovery drink to rebuild muscle. It has less sugar than a banana or other sports drink. Some have added sugar. Make sure to get coconut water with sugar and water in a 1:1 ratio – 9 ounces of coconut water no more than 9 or 10 grams of sugar. If you are working out strenuously, need sugar for endurance and need to replace sodium because you are sweating profusely, coconut water may not be for you. Coconut water is a good alternative to replace fluids and potassium as it has less sugar but may not be beneficial for endurance athletes. If you find that this Help or Hype may be useful to someone else please feel free to share it with them.